In the smartphone world, there are two extremes. Apple takes care of everything. Their designers have the best possible options for the highest common denominator of customers, and that’s how things are set. If you don’t like it, you can go to the Android extreme, where everything is customizable depending on preference. You can even go so far as to root your phone and set things up down to your exact details. In the world of cold air intakes, Airaid is like Android. You have options. Many of them. It’s not a bad idea to leave things open for the customer in the automotive aftermarket. Customization is literally the name of the industry. One size does not fit all, no two owners will have the same preferences, and options are always worth the extra cost of development. Airaid is fairly unwavering on one point, however. They believe that the filter should sit in a separate compartment from the rest of the engine, which is why they put so much focus on their Cold Air Dam, or CAD, a box that goes around the filter. Other intake manufacturers produce their own partitions, but they always seem like an optional afterthought. Airaid’s fervency makes sense, though. Without the CAD, the cold air coming in through the front of the car mixes and swirls with the hot air surrounding the engine and exhaust manifold before heading into the intake. A simple system of walls cuts the hot air out of that mix and concentrates it back to cold air. Colder air is denser, which means more oxygen to force-feed the engine, and that means more power. On to the customization. Like phone blocks or Mongolian barbeque, Airaid intakes let you mix and match with your cold air intake. Their basic system is their Jr. kit. The Jr. uses an Airaid high-flow filter in the factory box and an Airaid Modular Intake Tube, or Airaid MIT, leading from the box to the throttle body. These are great if you want added performance on a budget, or if you want to keep the factory look under the hood. You can also use an Airaid cone filter and CAD with the factory intake tube. Or you could go all the way and add the MIT to your CAD for the biggest power and torque gains. The coolest thing about this whole approach is that you can add components in stages as the funds come in or as you become more comfortable with the power increases. Want more customization? You might, if you’re wedging a big V8 into something that was never intended to host it. SBC swaps are getting more and more common and affordable, but weird swaps seldom leave room for well-engineered intakes. So Airaid took a look at that market and developed the U-Build-It, or UBI system. 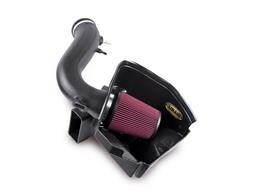 It’s the basic components of an air intake in all the customizable pieces you need. They even engineered a MAF sensor housing that fits the two most popular MAF sensors in America – Denso and Hitachi, so you don’t have to fabricate your own. We’re not done with the options yet. Airaid’s filters are customizable, too. The Synthaflow is an oiled, washable filter. Oil and cotton based filters are great because you never have to replace them. You just wash, let dry, and re-oil. Some oil filters also offer better flow and particulate filtering than paper filters. But maybe you don’t want to wash your filter. Airaid Synthamax dry filters are also awesome, far superior to the standard paper filters on the market. They offer dual-layer synthetic protection and dual screening for durability. But their party piece is the color option. The oiled filters have to be red, because the oil itself is red. But the unoiled filters have no such restriction, and are thus available in red, blue, or black. This may seem like a minor attraction until you’re trying to go for a certain look under the hood. So yes, you have options, and no, quality isn’t among them. You’re only going to get the best stuff with Airaid. 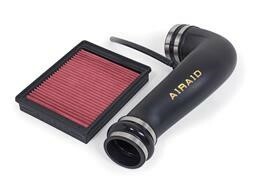 All of Airaid’s filters and intakes are handmade at their headquarters in Phoenix. Then they’re double QC checked for defects before heading your way. As for development, there’s no guesswork, here. Intakes are computer-drafted and dyno tested to prove their worth. 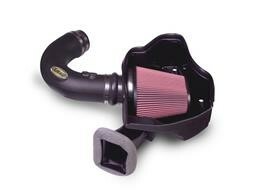 If, therefore, you like to customize, and we know you do, consider Airaid a strong contender for your cold air intake. Because you should build your ride to be your own.